Let’s face it: We all get busy and screw up once in a while… even the tooth fairy. Sometimes when little eyes shut with all sorts of anticipation as to what they’ll find under their pillow, they awake to a big disappointment when there’s not a single cent under there. That’s what recently happened to 6-year-old Emmy Strange of Orlando, Florida — not just one, but three nights in a row. According to her dad, Mike, “Twinkle Toes” got a little wrapped up in some family business and, night after night, failed to deliver. So when she finally did complete the job, she went big. Not only did she deliver a special silver dollar, but she left a receipt, complete with an apology and a bar code. “Thank you for your business,” it reads. Mike says that, as the third child, Emmy was already feeling a bit left out of the tooth fairy hype, so the tooth fairy wanted to do something special. 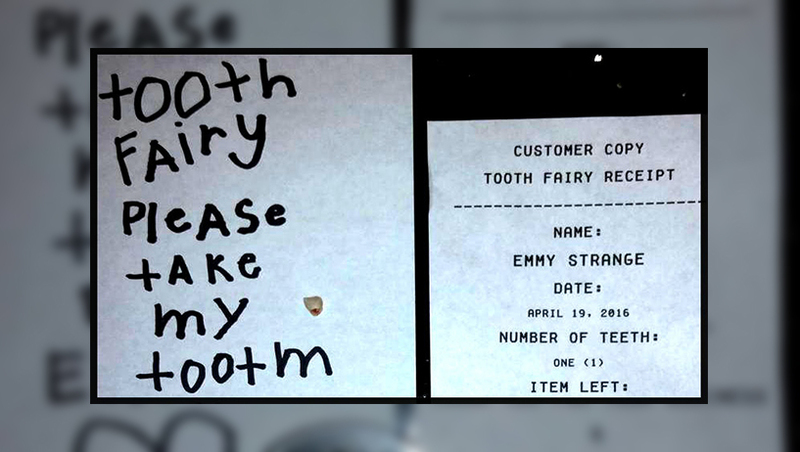 Tip for other tooth fairies: She used a special font called “Fake Receipt” and printed it out on the computer. As for the silver dollar, there’s a special backstory there. While saying goodbye to his 94-year-old grandfather a few years back, Mike’s eldest son, Max, lost his first tooth. When Mike relayed this news, his grandfather instructed him to go get a particular box out of the garage. “Inside were about 20 silver dollars that were totally black,” Mike said. His grandfather told him that, as a little boy, his family’s house burned to the ground. It was during the Dust Bowl Depression in Oklahoma, and they didn’t have a nickel to their names. When they were going through the aftermath of the fire, he found 200 silver dollars in a can that had been left in the walls of their house by a previous owner. Mike says he’d heard the story growing up, but as his grandfather was known to stretch the truth in the name of a good story, he didn’t believe it until that minute. He put the box in my hand and asked if the tooth fairy could deliver these to his great-great-grandchildren. I asked him why he still had 20 of these coins and never spent them. His mother had told him after they found the coins and saved the family from the poorhouse that he should always keep 20 of them so that they would never be penniless again. He died about 30 minutes after I left his bedside on the day he gave me the coins. 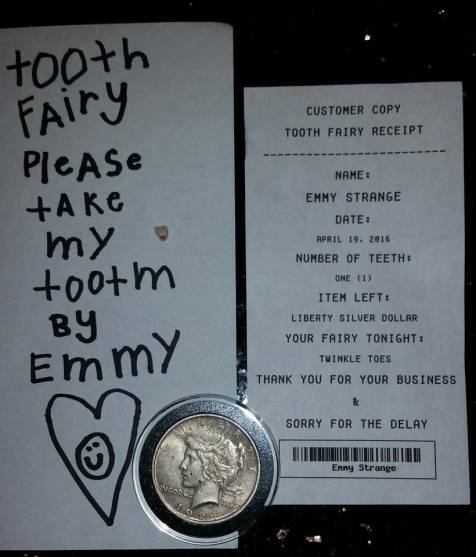 The tooth fairy brings our kids a Liberty silver dollar, and I remember my grandfather. Pretty hard for a tooth fairy to top that.